Trezor vs Ledger Nano S? Which is the best crypto hardware wallet? Which is best for you? Which should you buy? You are most probably here on this page because these are some of the questions weighing on your mind. Maybe you have decided to jump on the cryptocurrency bandwagon and bought one of the leading cryptocurrencies, Bitcoin, Ripple, or Ethereum. When it comes to cryptocurrency and your money, security is first priority! 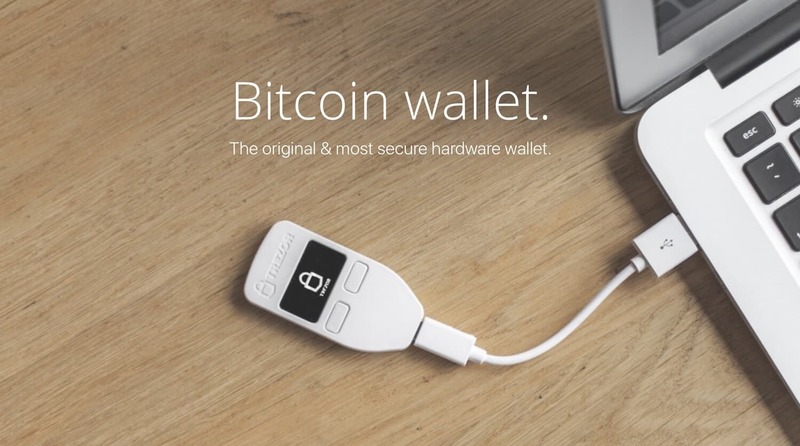 Therefore, you need a secure wallet. If you considering which hardware wallet is best for you, between Trezor vs Ledger Nano S, you need to read this guide. We recommend reading it beginning to end as it will compare and contrast the two brands. You’ll see the coins supported by Trezor and Ledger. You will learn how to set up these devices as the process is explained in simple terms. 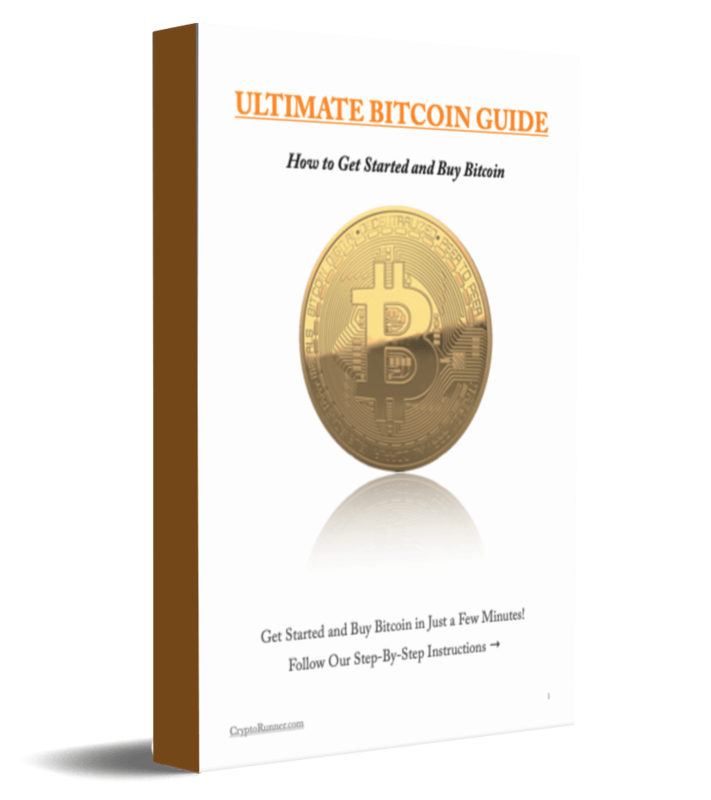 This guide will also give you all the needed information before you make a better-informed decision on which one of them to buy. In this complete comparison guide, you’ll find satisfactory answers to all of your questions. This guide includes the overview of the world’s best hardware wallets, Trezor and Ledger Nano S. You will also learn how to send and receive cryptocurrencies in your wallets. By the time you finish reading this Trezor vs Ledger guide, you will have a clear understanding of their differences and which hardware wallet is more suitable for you! So let’s begin by taking a look at their overviews. Ledger Nano S vs TREZOR: Which is Best? 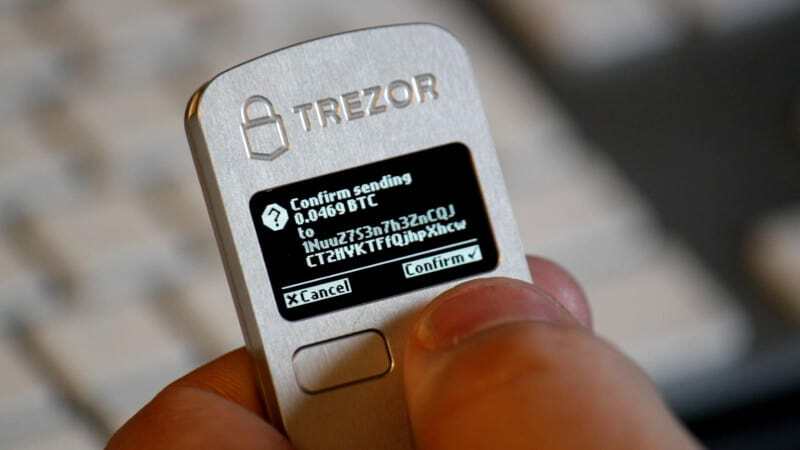 Introduced in 2014, Trezor became the first hardware wallet in the world that was developed by a firm based in the Czech-Republic named SatoshiLabs, the company that operates Bitcoin mining pool, SlushPool. With Marek Palatinus as its founder, Trezor hardware wallet was built with the sole purpose of fighting third party frauds, hackers as well as viruses. As an offline Bitcoin wallet, Trezor stores your private keys and digitally sign a transaction without an internet connection. This means that your valuable assets are kept safely, all controlled by you. However, while it is offline, it provides excellent connection flexibility when the need to buy or sell cryptos arises. 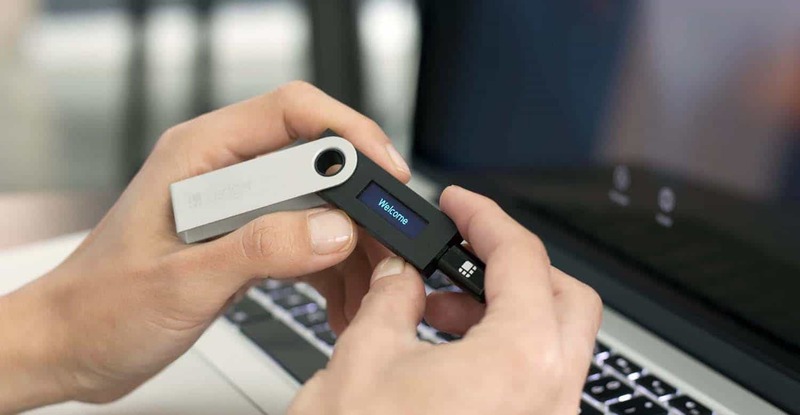 Just like Trezor, the Ledger Nano S wallet which comes in the shape of a USB drive was launched in December 2014 by a France-based company named Ledger. This hardware wallet is a result of the collaboration of 8 experts from the above mentioned firm, with backgrounds in cryptocurrencies and embedded security. Hence, Nano S is a secure and reliable alternative for storing your cryptocurrencies as it was designed with safety features in mind. From the brief overview of Trezor vs Ledger Nano S, you can deduce that both hardware wallets have been designed by their excellent teams who share the same concern; that of building a device that can secure cryptocurrencies. Trezor vs Ledger Nano S are undisputedly sleek in terms of the design. Both are hand-held devices as they are pretty small and designed to fit your pockets or carry around on a keychain. Both products are designed with a USB port with which you can connect to devices using the USB cable. However, there is a slight difference between Trezor vs Ledger. While Trezor is made out of plastic, Ledger Nano S boasts of a stainless steel casing, giving it a stylish look, as well as more protection from damage. Unlike Trezor, the Ledger Nano S is uniquely designed to be foldable. To use the device, you must unfold it. It is also worth noting that both hardware wallets have two physical buttons that are used to operate their hardware. Moreover, while each of the devices fully utilizes its screen for transaction information, Trezor’s screen is slightly bigger than Ledger’s. Regarding the interface, both hardware wallets have well-designed and easy to use interfaces. This is not hard to see when you compare the pictures of Ledger Nano S vs Trezor below. Unarguably, the Trezor wallet interface is obviously clean and also well designed to enable you to view your crypto transactions with the send and receive tabs placed at the top. It might interest you to know that Trezor is compatible with desktops, and all Android devices. It also supports Windows, Linux, and MacOS. In addition, Google Chrome extensions that will help with managing the gadget and the data are available for the hardware wallet. Again, the Ledger Nabo S interface is very attractive and user-friendly. All the information and tools that you need are clearly labeled. However, while the device is compatible with Windows, MacOS, Linux as well as Chrome OS, it will function properly with the use of Google Chrome or chromium. Extensions are also available for downloads. 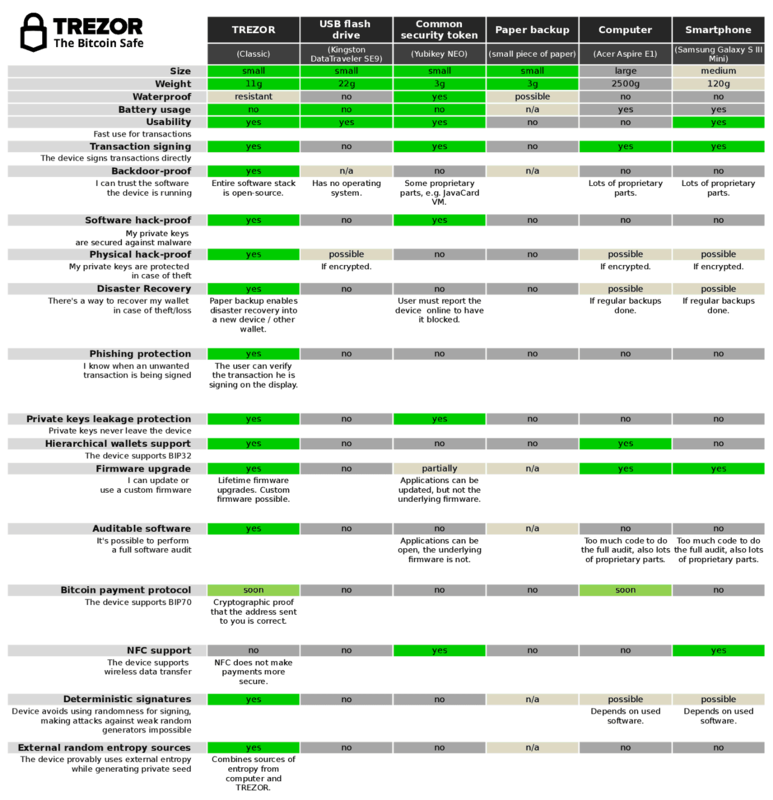 With this in mind, let’s proceed to the interesting part — comparing the coins supported by Ledger Nano S vs Trezor. Regarding cryptocurrency support, this is probably the key factor for users when trying to choose between Trezor vs Ledger. While nothing stops you from using both, let’s see the coins supported by these two devices starting with Trezor. At the moment, however, Trezor does not support popular coins like Ripple (XRP), Monero (XMR) and Cardano (ADA). Click here to see a list of coins supported. It’s worth mentioning that some of these coins do not have the full software support of the Trezor hardware wallet due to hardware constraints. That means you’ll have to make use of MyEtherWallet (MEW) as a safe storage for Ethereum as well as ERC20 tokens in your Trezor wallet. An interesting thing to note about Ledger is that, unlike Trezor, most of the cryptocurrencies are provided with full software support, including Ethereum. Hence, using MEW to store ETH and ERC20 tokens is not required. Next, let’s now consider the setup routines between Trezor vs Ledger. This is another important aspect of wallet support that matters to users. The setup process for Trezor vs Ledger Nano S are quite easy and similar, but not without some minor disparity. While the setup of both devices involves three vital steps, it can be completed in a couple of minutes. Let’s now describe the setup process of both hardware wallets starting with Trezor. 1. Plug the device to your computer using the micro USB cable and then download and install the Chrome extension which is needed for the device to communicate with your computer. 2. Choose a PIN code and enter it. You’ll also be required to enter your new PIN code twice. Notice that the numbers shown on TREZOR This code will be used to identify you as the real owner every time you plug it into a computer. Once the selected numbers correspond, you are good to go. Notice, however, that the numbers and their positions shown on Trezor screen change between the entries. Make sure to look at your screen each time to check the layout. On the welcome page, you’ll be given the option to either “Create New wallet” or “Recover wallet”. Click on the button “Create New Wallet”, otherwise import an existing wallet by the means of a recovery seed. Select your recovery seed. This is usually a 24 random word. Should your device end up in the wrong hands, this “seed” allows you to recover your wallet. Agree to the term and conditions and Yay, you are now ready to start using your Trezor Hardware wallet. Always remember, that this list of words equals your cryptocurrency. Learn more in the Trezor docs here. 1. Connect the device to the computer using the USB cable included in the pack and carefully follow the set of instructions on the ledger’s screen. Again, you’ll be presented with the option the option of creating a new wallet or importing an existing wallet using the recovery seed. 2. Next, choose 4 digit PIN code and make sure to write it down since 3 incorrect attempts will delete all the data stored on the device. 3. You’ll be presented with the option to either “Create New wallet” or “Recover wallet”. Ensure to write down the 24-word recovery seed if you choose to create a new wallet. 4. Once you install the Ledger app on your computer, you’ll see the message “Your device is now ready” pop up on the screen and you are ready to start using your Ledger hardware wallet. In order to use the Trezor and Ledger hardware wallets smoothly, you need to know the Apps they are compatible with. Below, are the many different applications compatible with the wallets. When it comes to Trezor vs Ledger, sending or receiving cryptocurrency using your hardware wallets is a no brainer. In the following 4 steps, we’ll show you how to send BTC using the Ledger. Plug your Ledger to your computer using the USB cable and enter your PIN code. Open the Bitcoin app on your PC once the device is connected and select the account, — Legacy or Segwit — you want to debit. Click on the ”Send” option on the following screen to move to the next interface. On this window, enter the BTC amount you want to send, add recipient address, select the transaction fees, and click send. We have provided the following video to make it easier for you to understand. While you can replicate the same method of sending cryptos above with Trezor, let’s show you how to receive BTC with your Trezor wallet. Plug your Trezor wallet to your laptop, using the included USB cable and unlock with your PIN code. On this window, choose the crypto-coin you want to transact to. Click on the “Receive” button at the top of the wallet app and then you’ll be provided an address you need to copy. In the window that pops up, paste the displayed address into the appropriate field, and yay! you are good to go. Note. This method of receiving cryptos is pretty much the same with Ledger. Having come to the end, the question remains, which hardware wallet is designated the best? Well, in this Trezor vs Ledger debate, it is quite difficult to pick a winner since the two hardware wallets have lots of striking similarities but with minor differences. Overall, both Trezor and Ledger are secure, supports hundreds of cryptocurrencies and tokens. Hence, you can’t go wrong if you choose to buy any one of them. However, the most important thing is to check if your crypto coin is compatible with the device of your choice. Remember, while Ledger Nano S currently supports more altcoins than Trezor, it is not as advanced as the latter. Beyond that, consider which of the wallets is affordable as one is cheaper than the other. When you carefully figure the factors discussed in this Ledger Nano S vs Trezor comparison, you’ll be able to make an educated decision on which device is the best for you. If you’d like to do a deeper dive, check out our separate Trezor Review and Ledger Review. Buy a wallet and stay safe! Is Trezor and Ledger Nano S safe? A hardware wallet is the safest way to store your cryptocurrency. Both Trezor and Ledger is trustworthy manufactures with strong brands. They are the most popular wallets in the crypto market. In other words, there is no safer way to protect your Bitcoin, Ethereum, Ripple, Litecoin and other cryptocurrencies. Buy Trezor here and Ledger here. What happens if my wallet breaks, gets stolen or disappears? Don’t worry. If your Ledger Nano S or Trezor wallet is stolen or lost you don’t lose your cryptocurrency. 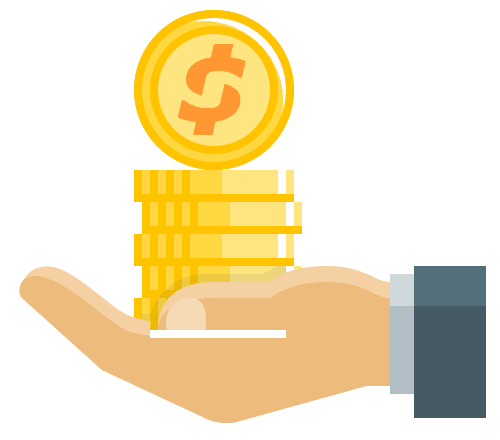 You can restore your cryptocurrencies on another wallet with specific software. However, this requires that you have your recovery seed. The safest way to keep your recovery seed is with a Cryptosteel! Is it safe to order Trezor & Ledger from retailers? No! Never buy a hardware wallet from retailers or eBay. The device may have been manipulated or be a copy. Always control that the package is unopened when your hardware wallet is delivered. Order your Trezor / Ledger from their official website. Order Trezor here and Ledger Nano S here. Can you store multiple cryptocurrencies on Trezor / Ledger? Yes! Trezor and Ledger support many cryptocurrencies and more are continuously added. In the sections, supported coins above, we have listed all available cryptocurrencies. What is required to use Trezor or Ledger Nano S? If you order a Trezor or Ledger Nano S, you will need a computer with a USB port. However, Ledger Blue works entirely wirelessly. You need Google Chrome or Chromium 50+ on your computer. No other software required. No matter what type of crypto wallet you use, you should make a backup. Otherwise, you risk losing your cryptocurrency! We recommend Cryptosteel, the best backup on the market.